This statement issued by founding partner of Building Trust International David Cole, began the call to the International Play-Scapes Competition. Playgrounds of today have become fields for designers to create safe and entertaining equipment that can foster imagination, activity, and fun for children and their parents. Contemporary play structures must address a multitude of developmental characteristics identified with growth and progression of childhood development -as well as conform to local government’s ordinances on safety. The task of enticing children outside to play has become more difficult with continued technological advancements that compete for children’s attention vs. the desire to be physically active. Plant-A-BALL PARKS creates a series of play structures that not only generate a sense of place, but also house a synergy of interventions at the site and city scale. The sphere is ideal for capturing the imagination of children as well as providing a versatile shape in which to encapsulate the proposed interior play program. A flexible primitive volume that can be manipulated into other platforms of play. The orbs height and scale provide adequate housing for the planting compartments above, as the shell’s design enables the trees and plantings space to grow through the membrane and stabilize itself with the existing sub-grade. This experimentation of play, integrated with ecology, provides an educational component for the children while they play amongst the BALLS. In addition to the BALLS being rehabilitation vehicles for different types of play: slides, swings, pools, climbing, and spinning; they also bring an ecological component into the parks. Through appropriate selection of tree and plant types, the BALLS can also provide habitat in both the urban and rural settings. Establishing these structures as multi functional facets for each site, they also allow high flexibility in terms of applicable program, based on the scale of each site. Designers and planners can choose from single play BALLS or a combination of them, with the option of suspension bridges connecting them into an elevated play network. The first intended site typology for these structures are vacant urban lots. Typically there are varied levels of contamination within these sites. The BALL shell will house all of the infrastructure needed to provide the tree with irrigation, drainage, and soil, as well as acting as a structural footing for the BALL. The filtration system embedded into the shell will capture rainwater and allow groundwater recharge into the existing groundwater table. Connections into existing urban infrastructure will be needed to provide electricity, water, and sewage for each site. The prefabrication of the BALLS off-site allows for rapid installation and quick turnover of the identified lots into playable and vibrant surfaces within the community. These structures are intended to provide planning departments with a tactically urban sustainable and playful solution to their issues of land vacancies. Vacant lots are eyesores on communities and are becoming more typical in the urban fabric. BALL parks can be utilized as a temporary or permanent installation into the site. 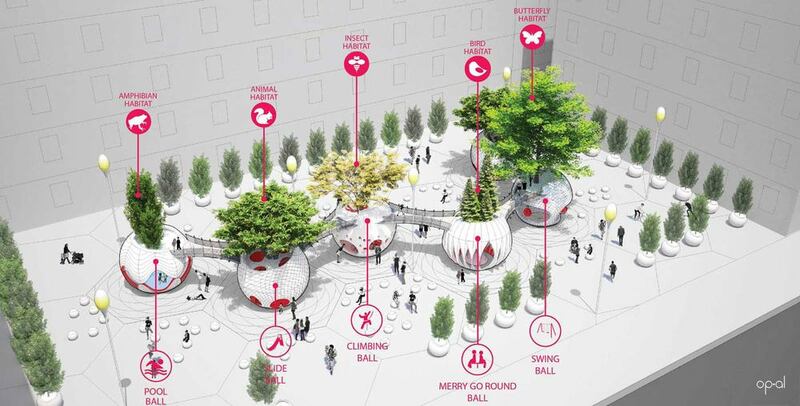 With the understanding that time and planning needs can change, the BALL structures are intended to be easily transferable but also provide an appropriate framework for redefining the contemporary play structure in flexible urban areas. They can also be utilized in existing urban parks as the standards for play equipment become more complex. Plant-A-BALL parks are an interactive, multi functional approach intended to engage children and adults in an outdoor recreational setting. This new model of equipment will promote and stimulate fun for the future of play, and create a series of miniature worlds for children to inhabit in the city. The competition had over 500 registered entrants and a jury including representatives from Building Trust International, Project for Public Spaces, BMW Guggenheim Lab, Landscape Architects Network, 3Space, Neon Stash, Land8 and academics & professionals from the fields of architecture and landscape design. 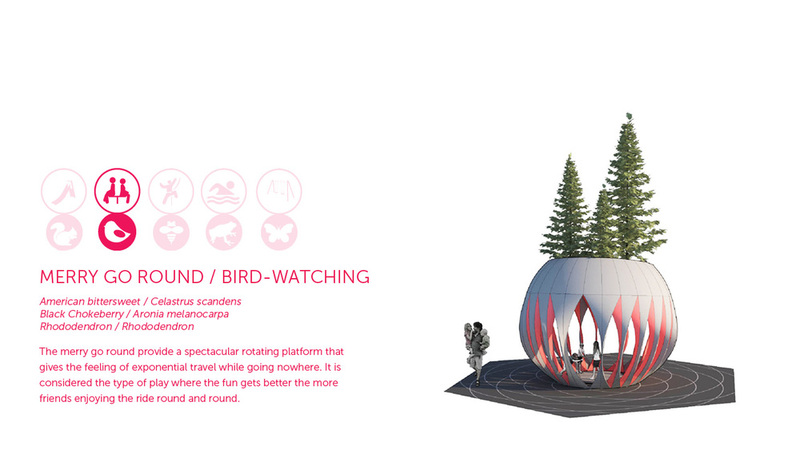 The jury awarded Plant-A-Ball parks an honourable mention due to the proposals high level of originality, innovative prefabricated design and ability to be constructed on various sites.